I passed this banner made out of sheets on my way to work on Monday. 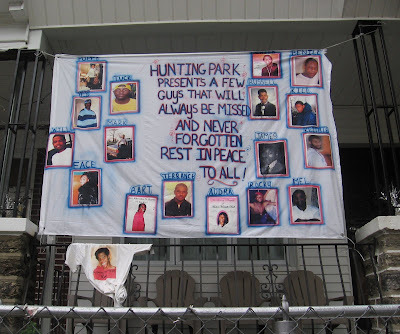 Over 4th of July weekend, the neighborhood had a block party to honor those who have died in the past few years. Some of them died of accidents; others were the victims of crimes. I heard there were speeches by loved ones and a moment of silence to remember the lives of those who have passed.